We have a full selection of carts available for your hotel. Choose from our full line of durable luggage carts. Satin finished steel frame with grey non-marking bumpers and dark grey carpeted deck. Includes free shipping to most locations in Canada. Satin finished steel frame with black non-marking bumpers and black carpeted deck. 2 swivels and 2 fixed wheels. Premium chrome finish and skirt. Please contact us for picture. This three-wheel compact carrier is a great item to help guests traveling light who would not normally use a larger bellman’s cart. Easily transports a small to medium bag or two and a lightweight garment bag. 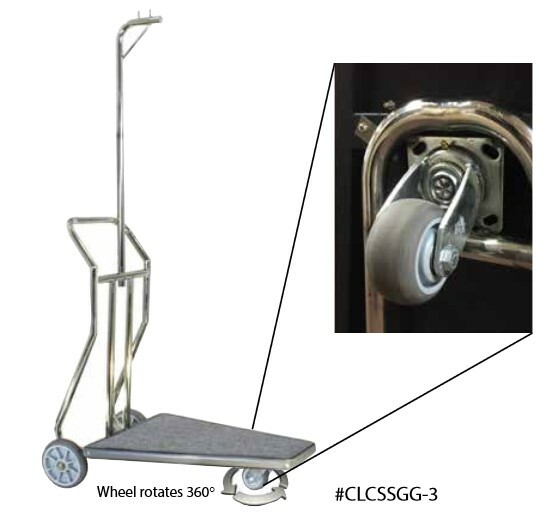 replacement NON-MARRING GREY POLY CASTERS. Available in swivel or rigid/fixed.